"The two courses gave me the qualifications I needed and helped me build on what I already knew. Some of the teachers have their own farms and they really know what they are talking about." Teenager Ashley Slater’s father and grandfather used to be farmers and as a boy, he spent many happy hours tinkering with his granddad’s vintage tractor. 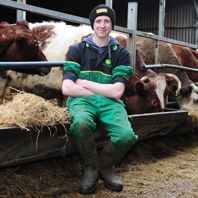 Farming is in Ashley’s blood and so, after completing his GCSEs, he knew he wanted to study agriculture. After college, his qualifications helped him land a general farmworkers’ job on a 300 acre organic cereal farm at Sutton Bonington in Nottinghamshire. He said: “The two courses gave me the qualifications I needed and helped me build on what I already knew. Some of the teachers have their own farms and they really know what they are talking about. “You also get an option to learn for various tickets you might need – like I got my pesticides tickets and rough terrain forklift ticket.